40059b:   bf 44 06 40 00          mov    edi,0x400644 ; "a = %#x\nb = %#x\n"
This is a segment of x64 assembly code, and I would like to rewrite this code into C. I've been reading Assembly books all day, and I'm still having some difficulty. I just want to understand what this code is doing. From messing around, I think that it performs some operations on an int (that's why I think the DWORD is there) and a long (that's why the QWORD is there). I think that this is true because I recompiled C code with those data structures and those words appeared in the Assembly equivalent, but I could be wrong. 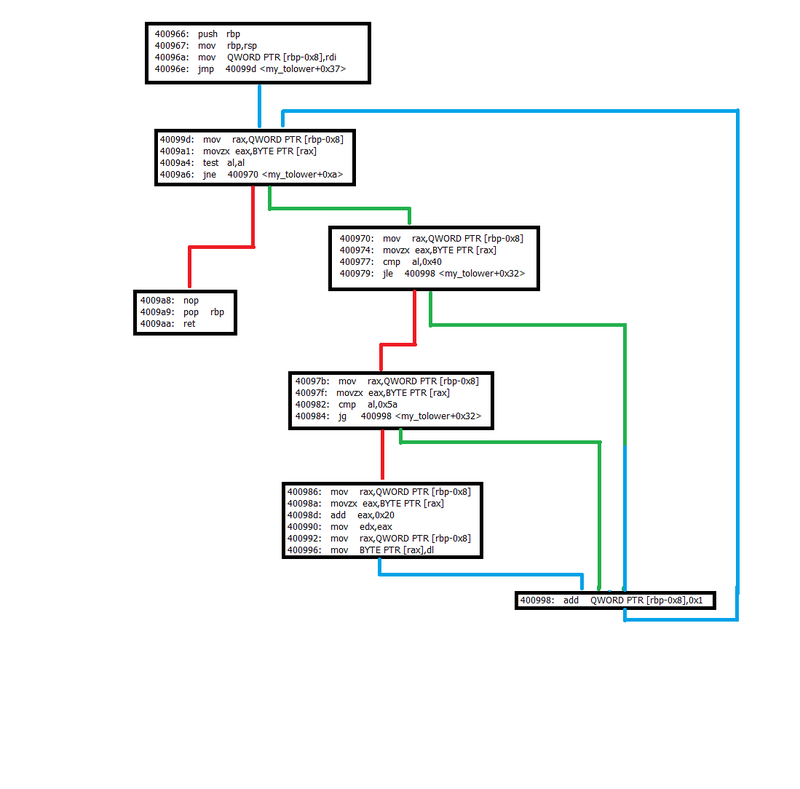 I believe the best tool for rewriting assembly to C is IDA Graph View, which is toggled with space. It let you see the function as Basic Blocks, connected by control flow instructions. In this specific function, I cannot spot any jumps so you will see one long block. The first thing you usually see in a function is the function prologue which sets up the stack frame. second, as 64 bit calling convention suggests, the first parameters are passed by registers, other are passed on the stack. The used registers are os-dependent (see table 5 at Agner Fog calling conventions). You can see that a "magic" value (0x1a2b3c4) is saved in a local variable and a pointer to it is created. Note that when it's saved, it is stored as little-endian, which means the order of bytes is reversed. And in a similar way, a value is calculated using next bytes, multiplied by 0x10 (=16), 8 and 1 (implicitly) respectively. results are stored in edi, and ored with the previous value. int magic_value = 0x1A2B3C4D;  // note that although i am using int, i mean uint32_t, a variable that has 4 bytes - a DWORD. So, what we can see is that the magic value is read back to a variable, while saving the little-endianness, which means we will get the reversed byte order if the magic_value. Also, as a general note, this code have could utilize loops to perform the read. EDIT: As to your second code. Here we can see jumps, so I created a graph view of the code. it makes reading it much easier. A bit of info on the graph: a green line means that the jump happens if a condition is met. A red line means that the jump happens if the condition is false. A blue line means that the jump is unconditional, it will always jump. Let's go through it and see what happens. The first thing we get to see after the function prologue is a single parameter is saved at rbp-0x8. On the block of 0x40099d we can see that the input is probably char *ptr, it dereference the pointer and read it's value. From the test al, al we can assume that the value is a string (and not just binary data, it is probably related to user input) and we stop once we have read the null terminator (\x00 = 0). The next block we will check is 0x400970. All it does is checking if the char pointed by rbp-0x8 is smaller or equal to 0x40 (0x40 is ascii for '@', 0x41 is 'A'). If it is, it continues (the single-line block at 0x400998). if(str[i] < 'A')  // as opposed to <= '@'. I can't remember I saw a code ever caring about '@'. Last block (0x400986). We now know that str[i] contains an upper-case letter. The code takes the character and add 0x20 to it. 0x20 is ascii for (space) and (a - A). It saves the result back to the string and continues. Looking at 0x4009a8, no result is passed to rax, that means the function probably doesn't return a value. if(str[i] < 'A' || str[i] > 'Z')  // as opposed to <= '@'. I can't remember I saw a code ever caring about '@'. We could also rewrite the function to show the single block that increments the pointer, which i believe is how the original code looked like. it makes more sense logically that we change the string if a condition was met, not if a condition is not met. if(str[i] >= 'A' && str[i] <= 'Z')  // as opposed to <= '@'. I can't remember I saw a code ever caring about '@'. Not the answer you're looking for? Browse other questions tagged disassembly assembly decompilation x86-64 or ask your own question.